Went to the court house and insurance office tagged and ins the bike went down to the trailer court and gave the kids a ride snip’s boys had a blast Travis put my tag on for me then I got Vicky on my scoter after that I was headed up to the store and stopped by Shirley’s and gave her and Gavin a ride then I went to subway and got a 12 inch sub for supper. had a very busy day. Aunt Cindy and Danielle tock pearl and the boys swimming at the new pool here in Seneca she said they had a great time. 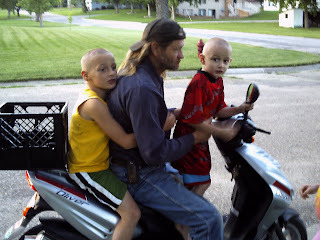 But all they talked about was coming to grandma Jody’s to see her new scoter. So after swimming she brought them to my house and I tock each one for a ride then surprised Danielle when I told her it was her turn .we went about 8 blocks she feel in lo9ve she wants one to.